Laser welding of body tissues may provide a means of closing surgical incisions that is better than traditional methods. The technique, pioneered by Professor Abrahim Katzir of Tel Aviv University, can also be used with great efficacy on cuts made inside our bodies during surgery. Prof. Katzir set out to find the right temperature for optimal wound healing, and to perfect a device that could maintain this temperature. He is the first to apply the carbon dioxide laser, coupled to optical fibers, for wound closure under a tight temperature control. His innovation is in the use of unique optical fibers made from silver halide developed at Tel Aviv University. Successful clinical trials have already been made on people undergoing gall bladder removal surgery. Following surgery, four cuts were left on the skin of the abdomen, two of which were sutured and two laser-bonded. The results of the trials suggest that the laser-bonded tissues heal faster, with less scarring. “We think plastic surgeons will especially love this invention. Bonding tissues that heal well without scarring is a true art that few people possess,” says Prof. Katzir. This method, he says, will be much easier to master than suturing and will generate a watertight bond, preventing infections and accelerating healing. Fans of Star Trek: The Next Generation will no doubt find this idea familiar. Starting in the 2250's, the laser scalpel was the surgical instrument of choice and was available in different wavelengths for varied cutting strength and depth of cut. However, as far as Dr. Katzir's work on closing surgical incisions is concerned, I'm more interested in the dermal regenerator. The dermal regenerator was used on a number of occasions to heal cuts and burns. Tip to Dr. Katzir - it is also useful in removing scars. Interested in other medical techniques and devices that you saw on Star Trek, and will now be used on you while unconscious? Of course you are. Rather than cutting into patients with primitive steel tools that haven't changed too much in the last several thousand years, doctors will focus high-intensity ultrasound beams. Hoana's technology transforms any hospital bed into a LifeBed, which invisibly tracks a patient's basic vital signs without any connection to the patient whatsoever. Aging Star Trek fans can't wait to get their hands on this one; we've been waiting since 1967. 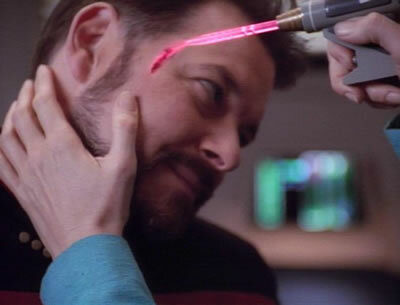 Dr. McCoy used something just like this - see Star Trek medical scanner demonstration video. The device uses compressed gas to accelerate lidocaine particles under the skin. 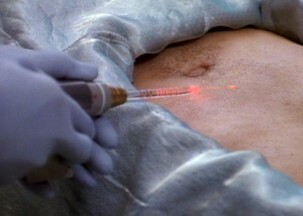 Read more about laser wound closure; thanks to Moira for the tip and the reference.